This is my Visual Mihi. This term we were given the task to do a Visual Mihi of yourself for your animation. In the middle is me. I am there for people to see and know who I am. On the top left hand corner there is a green flag with stars. That represents one of my cultures which is Cook Island. There are 15 stars on the Cook Island flag. 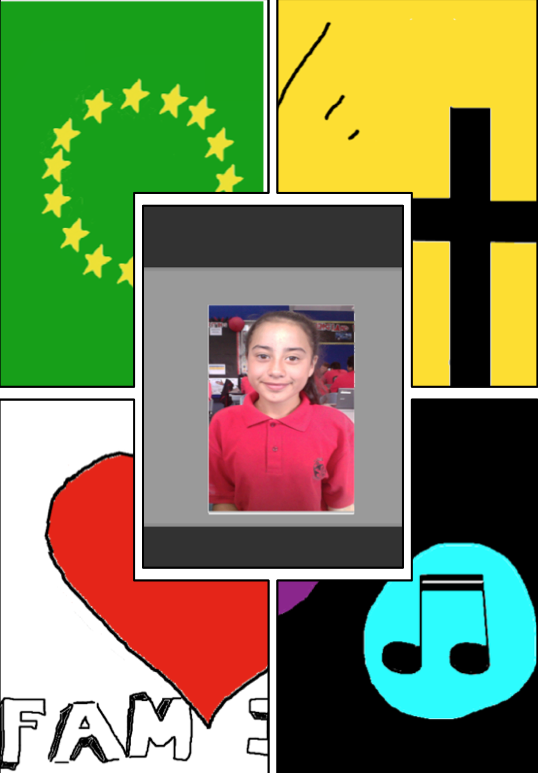 My other cultures are New Zealand, Maori and Tahitian. On the top right hand corner there is a Cross. This is the Lords Cross. I have that there because I believe in the Lord. If you are good to the Lord the Lord is good to you. On the bottom left hand there is a heart that has the word Family in it. I put that there because I Love my family dearly and always will. In my family I have 4 brothers that I love. I am the only girl in my family too. Lastly on the bottom right hand corner there is a symbol of Music. The symbol is there because I enjoy listening to music. Listening to music makes me feel free. I hope you learnt a bit about me. Hope you ENJOY!!! WALT: Use the 'part unknown' strategy to compare amounts. These few weeks we have been learning about New Zealands largest native bird the Moa. In our presentation we were given questions. The answers of those questions were in the text. Did you know that I know of 7 different Moa. They are:Bush Moa, Coastal Moa, Crested Moa, Eastern Moa, Giant Moa, Heavy-footed Moa and the Upland Moa. This is my reading task from weeks 2-3. We were given the text and questions. We then had to answer those questions. All of the answers were in the text.